One of the great pleasures of running a netlabel is meeting new artists, and today is no exception. 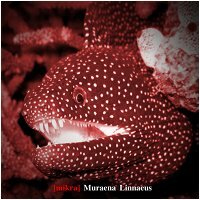 We are very happy to welcome Pavel Rassolko and his [mikra] project to our family of artists, with his brand new album Muraena Linnaeus. Followers of Earth Mantra will know that we like to cover a broad swath of sonic territory in our releases. Muraena Linnaeus pushes that envelope somewhat, offering the listener a mysterious, perhaps even suspenseful, journey through the hinterlands of dark ambience, experimentalism, and ambient noise. As one listens, sometimes things seem to teeter on the brink of recognizability, right before they careen off wildly into abstract textures, and then pivot again into soft strains of almost melodic synthesis. A wild ride, to be certain, one that gives the listener a distinctive kaleidoscopic vision of a world gone partially mad. Truly visual work, that sends shivers down our spine. One of the things that is often lacking in the experimental music world is a sense of musicality, a feeling of purpose and direction to the sound, and a cohesiveness that demonstrates structure and thoughtful composition behind the abstraction. As we listen to [mikra], we are struck by how purposeful his work is, by how unified and carefully constructed the sound sculpture is built, and by how well produced the final work is. Without a doubt, this is unapologetic dark ambience, but the kind that we find both creepy and strangely soothing, a duality that hints at the talent Pavel brings to his music. Very well done. Clocking in at only thirty-eight minutes and change, this is a relatively short album by Earth Mantra standards, but we think all our listeners will find something to love in Muraena Linnaeus. Spooky headphone music by an artist that we want to hear much more from. Just don't listen with the lights out.